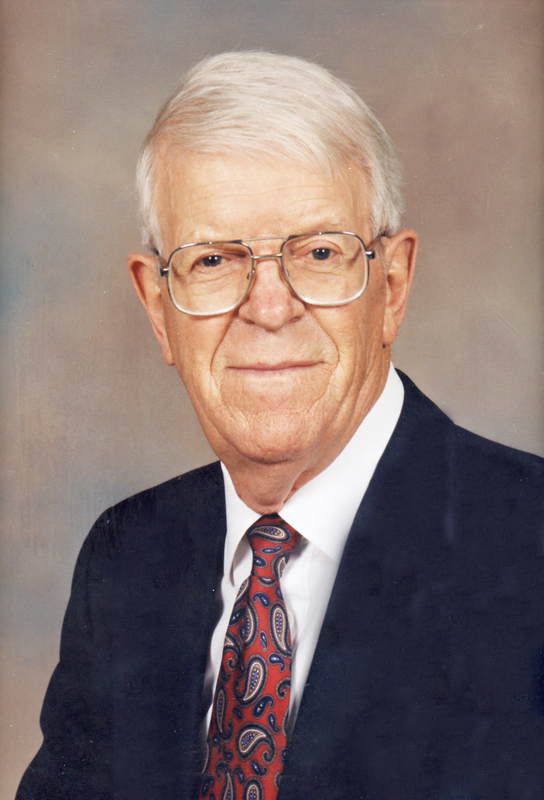 Kenneth Swenson was born at rural Lanesboro, MN, on May 17, 1920, the son of Carl P. Swenson and Emma Moen Swenson. He passed away peacefully surrounded by his family on Monday, December 3, 2018 at Trinity Center at Luther Park at the age of 98. Ken was baptized at Root Prairie Lutheran Church and confirmed at Bethlehem Lutheran Church in Lanesboro. He graduated from Lanesboro High School and upon graduation joined the Civilian Conservation Corp and was stationed at Lanesboro. In 1942 he was drafted into the Army, spending two years at Camp Dodge here in Des Moines and then in the European Theater of War until his discharge in April of 1946. He then attended Dunwoody Institute in Minneapolis, completing their offset printing course. He was married in 1947 to Ruth Anderson of Adams, MN. In 1948 they moved to Des Moines to make their home and Ken was in the offset printing business. Their two children were born in Des Moines – Susan Juergensmeier of Dillon, CO, and Steven of Coralville, IA. He was a member of Prince of Peace Lutheran Church. Ken retired in 1980 after 32 years in the offset printing business and then worked in clothing for ten years – first at Younkers Southridge and then at the Big and Tall Store in Seneca Plaza. Ken was an assistant Scout Master with Boy Scout Troup 56 at Prince of Peace Lutheran Church for a number of years. He was always very proud of his Norwegian heritage and was a charter member of the Sons of Norway in Des Moines. He was also a 50-year member of the Masonic Lodge. He loved his home town of Lanesboro and would tell all who would listen about its bicycle trails and scenic beauty. He loved cats and all animals, especially his cats, Mause that lived for 17 years, and Sherman who was with him for over ten years. Ken loved his family and was always proud that they were able to spend every Christmas together. He made the family’s first camping trailer and took the family on many camping trips while the children were growing up. His church was important to him. He also enjoyed keeping a well-cared-for lawn, reading, playing 500, and getting together with friends. He is survived by his wife Ruth, children Susan Juergensmeier and Steven Swenson, two nephews and their families. His parents, sister Stella Krause, brother Elmer, and son-in-law Bill preceded him in death. Memorial service will begin at 11:00 a.m., Wednesday, December 12, 2018, at Prince of Peace Lutheran Church, 2600 E Euclid Avenue, Des Moines. Family will begin greeting guests at 10:30 a.m. In lieu of flowers, contributions may be directed to Prince of Peace Lutheran Church.